building sanitation into your practices, etc. ….you’re already thinking about parts of an IPM strategy! So how do you complete that strategy and take a holistic approach? 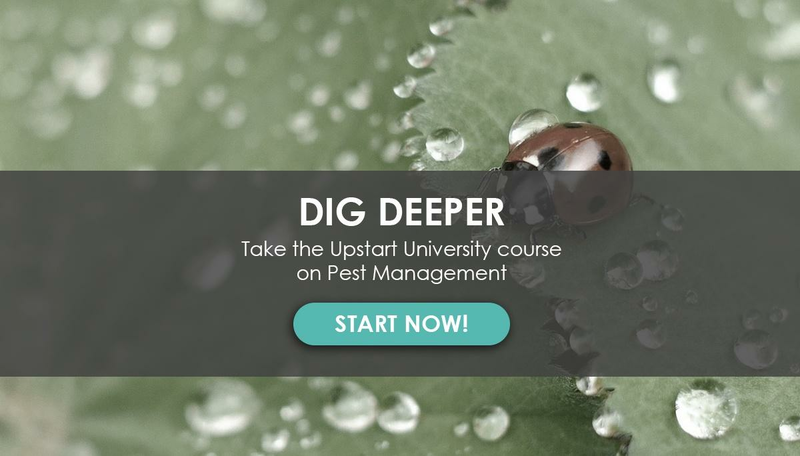 Pest management is a challenge that can grow complicated with different pests, pesticides, and dozens of other control methods. To effectively control pest populations, farmers need to combine all of this information and the options into a long-term plan. This will be your IPM plan; different controls and types of controls are strategically combined and scheduled to create a strong management system that fits your specific needs. You can design an IPM approach based on your specific pest, your specific crops, and any other environmental factors that come into play. Ultimately, this will result in fewer pests, less crop loss, a more sanitary farm (which helps with GAP and other certification), and better overall system health. Obviously, pests cause damage to crops, and any farmer will agree that they need to be kept out. A lot of farmers think that exclusion—a sealed greenhouse, double-door entryways, and a change of shoes when they enter—will be enough. Unfortunately, both insect pests and pathogens are prolific and abundant. One way or another, pests will find their way into a greenhouse, warehouse, container farm, and any other growing space. Exclusion can definitely reduce the chances of this, but it’s not wise to depend entirely on exclusion without backups. Too often, we see producers depending almost entirely on exclusion to solve their pest problems, then experiencing a boom in pest population that goes unmanaged. Disease and insect pests enter and inflict significant damage to crops. This damage translates to financial loss pretty quickly. It’s worth the upfront investment of getting an IPM plan ready in case exclusion fails. *Note: there are some farmers who have used primarily exclusion with success, but this takes a great deal of forethought and planning! Aesthetics may sound like a trivial issue, but most consumers care about buggy or damaged crops. Even if the crops are shaped strange, yellowed greens, hole-y lettuce, and spotty fruit make a real dent in the “curb appeal” of your produce. If you’re serious about selling your produce, you need to think about the aesthetic appeal. And that means pest control. The control of disease is only so effective if vectors are constantly reintroducing it—this is why you need a big picture pest management plan: IPM. So maybe you have a small pest problem. You’ve noticed a couple bugs in your greenhouse, but you estimate that there are only 30 or 40 in your whole greenhouse—not a big deal, right? But most business owners aren’t satisfied with an eyeball measurement and a guess on how bad the situation is. Economically, it’s wise to have some rationale about when pest controls need to take place. Another way to say this is: you need a point to determine the action threshold. An “action threshold” refers to the point at which your pest population requires control, marked by an “economic injury level” (EIL): the pest density at which your yield loss costs more than management costs. So if you estimate that pest controls for a specific pest will cost $40, then you can start to figure out the level at which that pest would cause you $40 worth of damage. When they reach that level, you need to control them to avoid financial losses. So how do preventative controls work into this? If you apply a control before the EIL, you never have the evidence of whether this represents a financial loss or gain. Should you apply controls preventatively? This is where pest control decisions become a bit of a numbers game. It’s up to you or the greenhouse manager to decide whether the likelihood of a pest outbreak is high enough to justify action. Note: If you’re into statistics, what I’m talking about here is determining your ? value. At what point is the probability of an outbreak acceptable for decision making? When it comes to preventative controls, we tend to play it pretty safe. A lot of preventative controls are fairly cheap and easy to maintain, and it’s worth it to us to prevent potentially costly outbreaks. 1) Only spray when you need to. This goes back to knowing your action threshold as determined by economic injury level. Be comfortable comparing possible outcomes and making decisions. The other half of this is creating a sustainable pest control plan. Chemical sprays can be easier for pests to adapt to and can change the way that your customers regard your produce. To avoid pests adapting to a spray and to keep your customers happy, only spray when necessary! Understanding your systems design, biology, and processes is extremely important to pest control. You must understand how a pest control will interact with each part of your system and anticipate the repercussions of that contact. 3) Let predators suppress pests when possible. Using other organisms to fight the battle for you is called biological control. If the natural enemy of a pest (say a predator that particularly like munching on that pest, or a parasitoid that lays its eggs inside that pest) is present, it is likely to stick around for a long time, and you can leave your pest control on nature’s autopilot. One common example of biological control is ladybugs or lacewings to control aphids. Lacewings are a popular biological control for aphids and thrips. 4) Only combine different methods when they are compatible. Don’t use multiple methods if they change the effectiveness of other methods OR reduce the overall pest suppression. For example, don’t use a general pesticide when you have biological insect controls working in the greenhouse. You’ll kill insect pests but remove another control along with them. Monitoring and measuring pests is extremely important not only to diagnosing problems but to follow up. Without monitoring, you have no information to use in decision making. If you use a control but never know how effective it was, then how can you decide whether to use it again? Learn more from Meredith Pratt here. Devising a personal IPM approach is really a “mix and match” type of activity. You first collect a lot of methods that you think you could use, and then you start puzzling them together until you have several that work well together. When you are finished you will have a system that suppresses and attacks pests on multiple fronts. Quick tip: Do Sun Tzu proud and plan for contingencies. Run through the “what ifs” and have responses in mind. What if pests adapt to a certain spray? What if something wipes out all my biologicals? What if? Having a variety of methods in place gives you a much more resilient control effort than if you use too few or similar methods. So where should you start? Start by collecting your methods. Chemical pest controls include sprays, fogs, and other chemical-based pesticides. You can research pesticides online, but we recommend talking to an extension agent. Every county has an extension office with people who stay up to date on pesticides, changes, current versions, which pesticides are legal for a certain area, etc. This is probably going to be the fastest way to get some pesticides chosen for your farm. Note: Aquaponic growers will have to take a few additional steps to make sure that their system with fish can handle a certain pesticide. Biological controls are fairly easy to find and implement. There are three ways to implement biological control, which you can find here. The pillars of mechanical pest management are exclusion, destruction, and removal. Sometimes, these are the low hanging fruit of pest management; they’re quick, easy ways to get the majority of a pest population or inoculum out of a growing environment. Don’t rule out simple mechanical controls! Most cultural pest controls are implemented by using smart growing practices like sanitation, smart spacing and crop arrangement, trap crops, promoting plant health, etc. These are simple habits that in some way interrupt the pest’s lifecycle.